On February 27 at approximately 9:25 a.m. the Calcasieu Parish Sheriff’s Office responded to a call at a residence in Lake Charles in reference to a disturbance. Once on scene deputies learned the 17 year old victim was hiding from Michael B. Mouton, 39, Lake Charles, a family member, who had battered her the previous night. During further investigation the victim told detectives that on the previous night Mouton confronted her at a relative’s house because he was angry over a family issue and he began to drag her by her hair and force her into a vehicle against her will. Once inside the vehicle she stated Mouton began striking her, leaving visible injuries and marks. The victim told detectives she was driven to her residence where he continued to batter her and hit her head against a window inside the home, breaking the window. She told detectives Mouton pulled her hair so hard that some of her hair had been ripped out of her scalp. According to the victim she was then forced back into the car and driven to another house where Mouton went inside the home and returned to the car with a gun and while pointing it at her, threatened her. She told detectives she was able to flee on foot to a nearby house where she contacted a friend for help. Mouton was arrested and booked into the Calcasieu Correctional Center and charged with aggravated battery; aggravated assault with a firearm; and 2nd degree kidnapping. 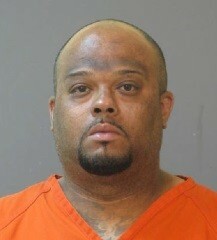 Judge Clayton Davis set his bond at $750,000. The victim sustained moderate injuries and was transferred to a local hospital for treatment and was later released. CPSO Detective Christopher Melendy is the lead investigator on this case.